The Simons Foundation’s Mathematics and Physical Sciences department is pleased to host Foliation Theory in Algebraic Geometry, a five-day symposium intended to foster communication and interaction between experts in the fields of holomorphic foliation theory and higher dimensional algebraic geometry. The symposium, which will take place in the Simons Foundation’s Gerald D. Fischbach Auditorium in Manhattan from September 3 through 7, will bring together researchers from around the world. Attendees will be encouraged to attend open and informal discussions during meals and breaks and will include not only the 18 invited speakers — scientists from Europe, South America and Asia — but also graduate students, post-docs and other researchers in the field. 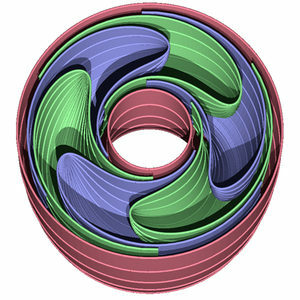 Analytic foliations have long been known to play a fundamental role in birational geometry, and recent advances in both foliation theory and birational geometry have shed light on unexpected connections between the two areas. But some important questions remain unanswered. James McKernan, an organizer of the symposium and professor of mathematics at Massachusetts Institute of Technology and University of California, San Diego, believes that researchers from these two fields can benefit from each other. “Personally, I am looking forward to learning more about foliations, a subject which I don’t know so much about, but which I think is important to my area of research, higher dimensional algebraic geometry,” says McKernan. If you would like to attend this conference, please visit https://sites.google.com/site/foliationtheory/home. This symposium has finished, but check here soon for video of the lectures.